Thanks to Doggy Loot I am a really happy girl. And I didn't even have to ask. They offered. And that is not something that happens everyday. I've been a little bit hesitant to write about these dog/cat Groupon type shopping sites. Being a person that really loves and wants to support small, local business I have been a little concerned about what these type of websites will do to the small mom & pop shops. And why a manufacturer would really want to sell their products so cheap. So I have been guiltily buying a few things here and there. I have always been happy with everything that I have gotten. Shipping is fast, my charge card has been charged correctly, no spam and happy dogs and cat. After my customer service experience today, I have to say that I am going to be a loyal Doggy Loot customer. And I am not going to feel guilty shopping any more. Are You A Fashion Forward Dog Lover? Then I have found the watch for you! Just found this big faced watch, with a silicone strap, rhinestone bezel and a big paw in the middle. They come in a the staples of black and white, as well as some brights. You can get them for $15.99 at Terrier Toys. Have I Got A Shopping Secret For You . . .
Thursdays at Petco is markdown day. At least it is on the ones that I have been to. So if $ is tight, that is the day to get first shot at the markdowns. And if you are really nice and talk to the manager, most of the time you will be able to get the 30% off almost expired food treats marked down to 50%. When I ask, I let them know that I want to but alot and I really do stock up when they help me out. Of course I would prefer that local, independent stores be first on your (and my) list when it comes to shopping. But sometimes there just isn't one close (and I know. I lived in Hew Hampshire for awhile and there was nothing in driving distance) or you are just on a really tight budget, and just can't. Love My Dogs and I Love My Bling And I Really Love It When They Can Go Together. What better way to show the world that we love them than to wear our favorite breeds on beautiful piece of jewelry? That’s exactly what Tracileigh01, owner of My Two Cavaliers at ETSY, thought when she started making European Charm Bracelets for all of us dog lovers out there. Not only can you choose charms that represent your favorite dog breed, or dog breeds, but you can pop them on beautiful charm bracelets adorned with Murano glass and Tibetan silver beads. She even does custom orders should you not like any of the bracelets or necklaces that are currently available. That’s right, if you can dream it up, she can probably get it for you. Her prices are also extremely fair when compared to other companies that sell European charm bracelets, and she often has sales and discounts available for holidays and sometimes just for fun. Convinced? Well check out these beautiful bracelets at My Two Cavaliers on Etsy, and decide for yourself! Just have to share a company that I love, Pettags4Less. With all the moving I have been doing, I have ordered from this company more than once and each time they have been fantastic. You have multiple choices of colors, styles, sizes and fonts. So you are able to pick the perfect tag for your pet. A single side tag is $2.39. At that price every dog can have an up to date tag. With 6 More Weeks Of Winter . 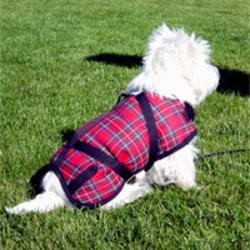 . .
you might want to visit www.terriertoys.com and check out their Snuggler and Turnout Coats. We have outfitted each one of the Moe Toys dogs with these coats for all of their travels. We have found that they are excellent quality, stay on the dog and clean up very well. Shown modeling the coat is the very stylish Phoebe, who is the Terrier Toys mascot.